In this chapter the author desires to give some hints about the treatment for diseases most common to horses. There are two kinds of colic, spasmodic and flatulent. Spasmodic colic is known by the pains and cramps being spasmodic, in which there are moments of relief and the horse is quiet. Flatulent colic is known by bloating symptoms and the pain is continual, the horse kicks, paws, tries to roll and lie on his back. For spasmodic colic, give � ounce laudanum, � pint whisky, � pint water; mix well and give in one dose. If this does not help, repeat the dose in half an hour. For flatulent colic give, � ounce laudanum, � ounce turpentine, � pint raw linseed oil, � ounce chloroform, � pint water. Mix well and give in one dose. Repeat in one hour if the pain is not relieved. Sometimes there is no other symptom than the bots seen in' the dung, and in most cases no other treatment is needed than some purgative. Mange is a disease of the skin due to a class of insects that burrow in the skin, producing a terrible itch and scab, the hair falling off in patches, and the horse rubs against everything. After the affected parts have been washed in soap- water quite warm, dry and rub in the following: 4 ounces oil of tar, 6 ounces sulphur, one pint linseed oil. Make a strong tea of tobacco and wash the horse with it. There are many kinds of worms. Three kinds of tape worms and seven kinds of other worms have been found in the horse. The tape worms are very seldom found in a horse and the other kinds are easily treated by the following: One dram of calomel, I dram of tartar emetic, 1 dram of sulphate of iron, 3 drams of linseed meal. Mix and give in one dose for a few days; then give a purgative. Repeat in three weeks to get rid of the young worms left in the bowels in the form of eggs, but which have since hatched out. Distemper is a disease of the blood. The symptoms are: Swelling under the jaws; inability to swallow; a mucous discharge from the nose. Give the horse a dry and warm place and nourishing food. Apply hot linseed poultice to the swellings under the jaws and give small doses of cleansing powder for a few days. As soon as a case is satisfactorily recognized, kill the horse, as there is no remedy yet discovered that will cure this terrible disease. 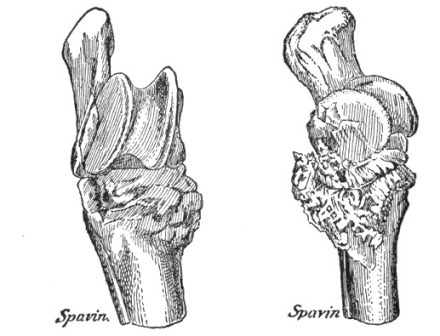 There are four kinds of spavin and it is difficult for any on~ but a veterinarian to tell one kind from another. In all cases of spavin (except blood spavin) the horse will start lame, but after he gets warmed up the lameness disappears and he goes all right until stopped and cooled off, when he starts worse than before. There are many so-called spavin cures on the market, some of them good, others worse than nothing. If you don't want to call a veterinarian, I would advise you to use "Kendall's Spavin Cure." This cure is one of the best ever gotten up for this disease, and no bad results will follow the use of it if it does not cure. It is for sale by most druggists. In nearly all cases of lameness in the hind leg the seat of the disease will be found to be in the hock joint, although many persons (not having had experience) locate the difficulty in the hip, simply because they cannot detect any swelling of the hock-joint; but in many of the worst cases there is not seen any swelling or enlargement for a long time, and perhaps never.